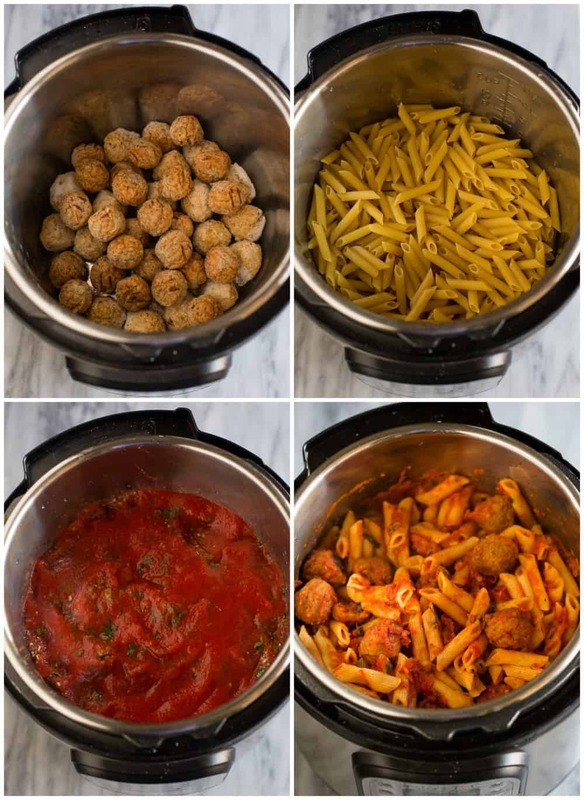 This simple Instant Pot Pasta with meatballs is the type of easy, all-in-one instant pot meal that we all love! 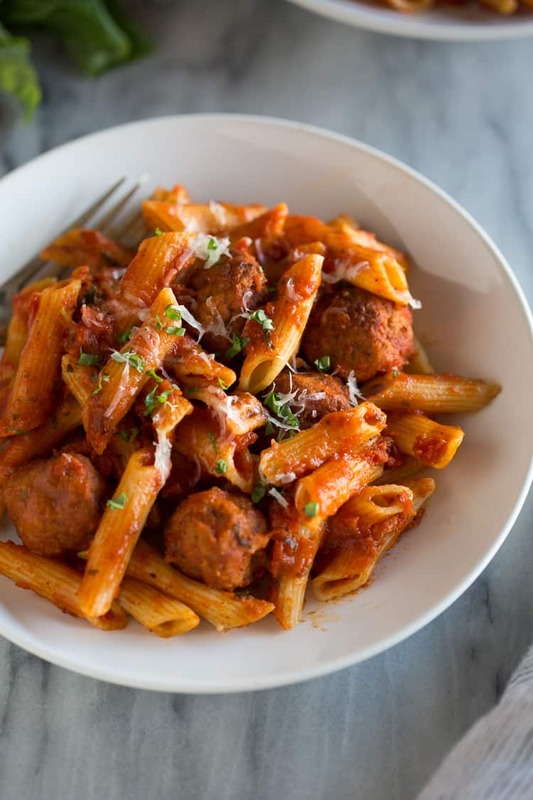 It includes uncooked penne pasta, frozen meatballs and a simple homemade red sauce. Hey everyone, this is Lauren visiting again from Tastes Better from Scratch. 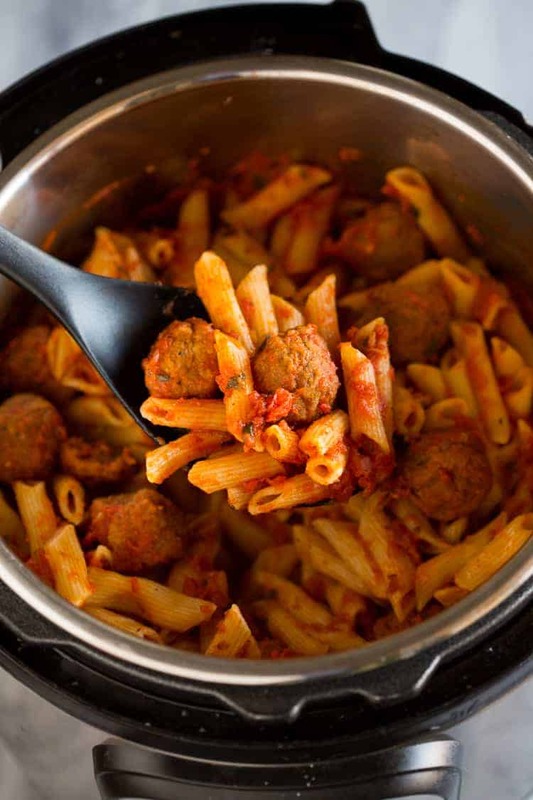 I’m a huge fan of easy Instant Pot dinners and this simple pasta dish is exactly that. It’s perfect for busy weeknights when you only have a few minutes to throw dinner together, but you still want something homemade. I’m confidant your family will love it! Add frozen meatballs to the bottom of the Instant Pot. Add the uncooked penne pasta and water. Add the crushed tomatoes, seasonings, and tomato sauce, making sure to cover the noodles completely. Cook at High Pressure for 5 minutes, followed by a quick release of the pressure when the timer beeps. It’s as easy as that! You can use frozen meatballs or uncooked homemade meatballs. If using uncooked meatballs, brown them in the bottom of the instant pot first, on the sauté setting. You don’t need to cook them all the way through. I like to add fresh shredded parmesan and crushed red pepper as garnish. Substitute crushed fire roasted tomatoes to add some spice. Serve it with a green salad and breadsticks, for a complete meal! Add meatballs to the bottom of the Instant Pot. Add uncooked pasta on top, spreading into an even layer. Pour water over pasta. Add crushed tomatoes, seasonings and tomato sauce and gently stir with a spoon. Smooth the sauce to completely cover the noodles. Cook on High Pressure (Manual) for 5 minutes. When the timer beeps, do a controlled quick release until pressure has released. Stir. Allow to cool for 5-10 minutes before serving. To substitute uncooked homemade meatballs, brown them in the bottom of the instant pot first, on the sauté setting. You don't need to cook them all the way through. Then make the recipe as directed. By controlled release do you mean quick release?